What is Dharma Yoga Virginia? Dharma Yoga Life of a Yogi 500-hour Teacher Training program: all applicants to this program must have a 200-hour certification from Dharma Yoga or a Yoga Alliance approved 200-hour certification that is recognized by Dharma Yoga, in addition to meeting the program entrance requirements listed in the entry above for the 200-hour program. Please note that the DY LOAY 500-hour TT is an advanced training immersion expressly for serious seekers and dedicated aspirants. The emphasis here is on taking one’s personal practice to the next level and on mastering and learning the mechanics of sharing the Dharma II and Dharma III series. In order to achieve certification, you must complete and submit all pre-training homework assignments, attend every session of the contact hours during the actual immersion program, achieve a passing grade on both the written and oral exams given during the contact hours of the training, complete all of the assignments given during the training where applicable, and complete and submit all supporting documentation and assignments relating to the post-training internship. Please note that in addition to assignments in reading and writing prior to your training, you will be expected to begin shifting over to a vegetarian diet. Between the contact hour modules of the advanced teacher training immersions, you will have daily assignments in Asana (postures), diet, Pranayama (breathing exercises), Dharana/Dhyana (concentration/meditiation), journaling and actual teaching assignments to complete. 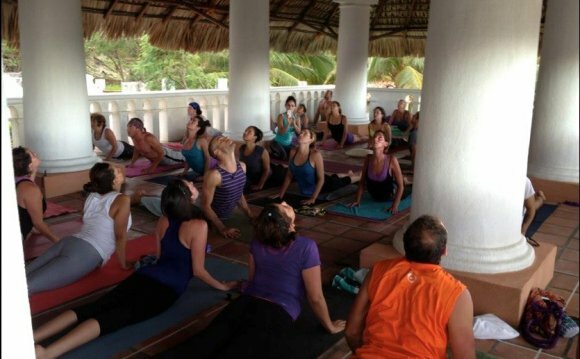 During the actual contact hours of the DY LOAY TT, you will be exposed to the full range of classical Yogic techniques and will be expected to participate fully in all aspects of the program. The post-training internships for all programs include teaching, taking class, being observed while teaching and Karma Yoga (selfless service) components that will be explained in detail towards the conclusion of the relevant DY LOAY TT contact hours. Full tuition for the 500-Hour Teacher Training is $4, 995. Please note the schedule of fees below that get added to the base tuition. Deadlines regarding these fees are non-negotiable. Financial Assistance is available for qualified candidates who demonstrate financial need, an earnest desire to help spread the teachings of Yogi Sri Dharma Mittra and have been connected in some way to the larger Dharma Yoga community prior to application. Meeting the eligibility guidelines for the DY work-study scholarship is not a guarantee that you will receive one. Financial Aid is determined based on the degree of need, annual household income, the ratio of worthy applicants to resources devoted to Financial Aid and the applicant’s sincere desire to become a Certified Dharma Yoga Instructor (DYRT). Candidates must apply for, be accepted into the Dharma Yoga Life of a Yogi Teacher Training program and pay the $2, 000 reservation deposit to secure a place in the training before applying for Financial Aid. To apply for Financial Aid, request the “DY LOAY TT Scholarship Application Form” from us. Applications are accepted on a first-come, first-served basis up to 10 weeks before the start date of each training. Please note that the Dharma Yoga Center is not a non-profit, has no endowment fund and receives no federal or state funding for its programs. Most often if Financial Aid is awarded at all based on a variety of factors, it will only cover a small percentage of the overall tuition. Please e-mail your completed application form to loayassistant@dharmayogacenter.com as a Word document. For assistance with any scholarship related questions, please contact Adam at adam@dharmayogacenter.com or at 212 889 8160, ext 308. Applications are processed on a first-come, first-serve basis. DY LOAY Teacher Trainings fill quickly, so we recommended that you apply early.